As anyone living in Austin, TX knows, this weather we have been having is a nice, much-needed change! The cooler air and the rain are both pleasant changes that have been lacking from our 104 degree heat waves this summer! And as much as we needed the rain, nothing could be more frustrating than having a torrential downpour during your wedding day. This, my friends, is why renting a tent for ANY outdoor wedding, is a good idea. Yes, tents are a large investment. Yes, they may go unused. BUT, when you weigh the pro’s and con’s of having one scheduled JUST IN CASE, it stops being a complication and becomes a necessity. Let me explain. There is a 2 week cancellation policy on tents, so if you reserve one and decide the week-of that you don’t need it, you forfeit 50% of the rental fee. This can be a large investment, especially in this economy. But how much does your TIME cost? First off, you may save yourself a trip if you were planning on picking up all the rental items yourselves. Since tents have to be delivered, you can save some time and effort just having everything else delivered at the same time. Secondly, in the instance of rain, obviously, you have coverage. You’ll have coverage in extreme heat. 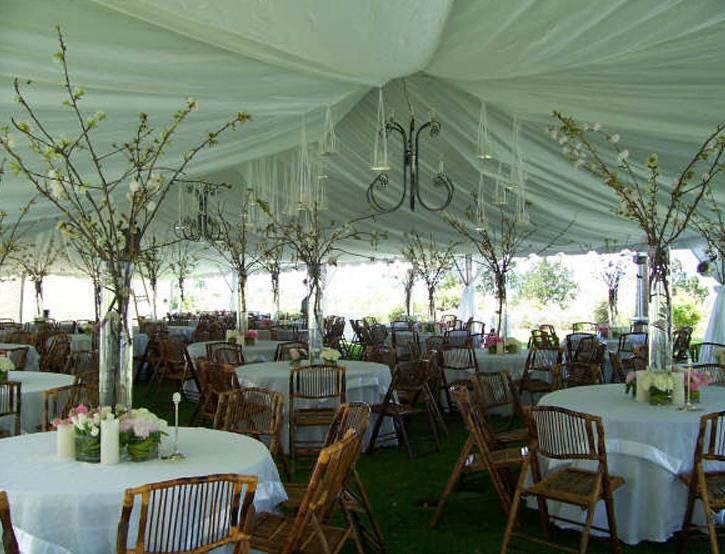 You provide a nice canopy for your guests to meander under during the reception. Decorated appropriately can really create an ambiance for your guests. Lighting them also gives unique opportunity for personalization, with color schemes, pictures, or monograms. And lastly, with sidewalls or a clear top you can create a nice cozy atmosphere for your guests to feel at home with while you party the night away under the stars (assuming the rain isn’t falling at that point). In conclusion, think of them as an insurance policy. You can always use them if you have them reserved, but you cannot always get them last minute. Better safe than sorry, I always say!